Handyman Electric LLC is not a franchise. 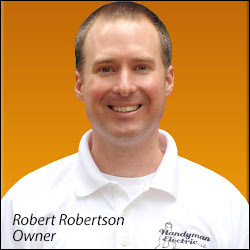 Robert Robertson (portrait to the right) of Spokane founded Handyman Electric, LLC with the mission to bring a fresh demeanor and delivery of customer service for your residential electrical repair and improvement needs. He is the owner, operator, and the electrician who will be providing you with quality service. Robert has been a business owner and electrical administrator for 11 years with a total of 18 years of experience working in the residential/commercial electrical field, where he gained knowledge and experience installing electrical systems in new homes and remodeling others. His strengths lie in troubleshooting and creatively formulating solutions for challenging projects. As a perfectionist, he prides himself with doing the job well, showing up to your appointment on time, providing a clean service, giving you a realistic understanding of your project and communicating with you to provide the service that you desire. Robert is committed to ensuring that his customers receive the highest quality service with professionalism and attention to detail. He takes care of each client’s needs from start to finish and is accessible and available around the clock to address any of your questions or concerns. For a complete list of what Robert offers, please visit his Spokane electrical contractors services page. Contact us today for a no-obligation consultation or request an estimate!